John Wyatt helps us to navigate the arguments for assisted dying with hearts and heads engaged, and above all with our Bibles open. The case for assisted suicide can seem so compelling. Surely it can't be wrong to help desperate people to kill themselves? Don't we have a right to take our own lives in certain circumstances? There are no trite or easy answers. John Wyatt helps us to navigate the arguments with hearts and heads engaged, and above all with our Bibles open. There are practical and compassionate alternatives to assisted suicide, and as many who have gone before us have found, the end of our lives on this earth may turn out to be a strange and wonderful opportunity for growth and internal healing. Death and dying are not comfortable topics for discussion. They raise uneasy questions and anxieties, reminding us of our own frailty and vulnerability, and opening up fears about the impending loss of our loved ones. I have found writing this book emotionally challenging and at times disturbing. But I am absolutely convinced that these are vital topics that we cannot avoid, but must face head-on. Just as we can’t escape being confronted with death and dying in our personal lives, so also in the public arena these topics have taken on a strategic importance. Scarcely a week goes by without another high-profile media story highlighting the inadequacies of end-of-life care in our health services, or the tragic story of an individual who committed suicide to escape the suffering and indignity of a terminal illness. Some of those real-life stories feature in the subsequent chapters. Sophisticated campaigning organizations across the world are using these personal tragedies as the driving force to change the law to allow various forms of medical killing. Their efforts seem to have been highly effective in influencing public opinion in favour of legislation for medically assisted suicide. In the UK, assisted suicide has been the topic of repeated high-profile debates in Parliament, and some have concluded that the pressure for a change in the law has become irresistible. Several prominent Christian leaders, including the previous Archbishop of Canterbury Lord Carey and South African Archbishop Desmond Tutu, have publicly stated that they have changed their minds. They are arguing that we have a specifically Christian duty to provide the option of a quick and painless suicide for those who request it at the end of life. So what are the forces that are driving this demand for a change in the law? Is it about individual choice and control over our lives – what philosophers refer to as ‘autonomy’? Or is it about the prevention of suffering? Should medical killing be restricted only to those with terminal illness, or to all who are facing hopeless and unbearable suffering? Is it possible to construct a law which has an internal logical consistency and is at the same time robust and safe in practice? Of course, these are much more than philosophical, political or legal issues. We must never forget the personal tragedies and fears that lie behind the public debates. If we are followers of Christ, then it is our first responsibility to empathize, to try to comprehend and enter into the human suffering, fear and desperation that many people face at the end of life. We should talk about these issues not with condemnation, judgment and rhetoric in our voices, but with tears in our eyes. This is not an easy topic, and the public debate is often emotive, confused and confusing. I have tried to make this book as up to date as possible, but the target is continually moving, and, to my frustration as an author, fresh developments are occurring almost weekly. What follows is intended for lay people and does not presume any medical knowledge. A glossary of medical and technical terms is provided at the end. My aim in this short book is to provide a road map to the current public debate about assisted suicide and euthanasia, both in the UK and in the wider international scene. In chapters 1–3 we will look at the strange history of mercy killing, and then at current euthanasia and assisted suicide practice in countries that allow various forms of medical killing: the Netherlands, Belgium and Switzerland, and in several US states. In chapter 4 we will look at some of the underlying social, demographic and economic forces and trends behind the pressure to change the law. In chapters 5 and 6 we will focus particularly on the two main arguments put forward in favour of medical killing: the argument from compassion and the argument from autonomy – the right to direct one’s own life. Next, in chapter 7, we turn to the perspective of the historic Christian faith, and the understanding that each human life is uniquely valuable, yet fragile and dependent on others. In chapters 8 and 9 we will turn to practical medical alternatives to assisted suicide, especially to the development of modern palliative care as an effective and compassionate way of helping people to die well and ‘to live before they die’. We will also look at practical aspects of the care of the dying, including treatment decisions, advance statements or ‘living wills’, and the option to appoint an individual with legal powers to make medical decisions on our behalf. In the final chapter we will look briefly at a Christian understanding of what it means to die well and to die faithfully in the light of the Christian hope. The truth is that dying need not be an entirely negative experience. As many who have gone before us have found, the end of our lives on this earth may turn out to be a strange and wonderful opportunity for growth and internal healing, even an unexpected and unlooked-for adventure. Writing this book has not been an easy experience. Yet I have finished with a greater confidence in the abiding relevance of historic Christian thinking to what it means to die well in the twenty-first century, and a thankfulness for the remarkable advances that have been achieved in the medical and practical care of people at the end of life. Thank you for accompanying me on this strange, uncomfortable, and yet ultimately hopeful, journey. Why not help the terminally ill end their miserable lives? 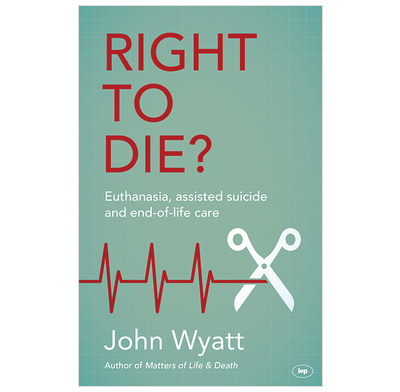 Euthanasia and assisted suicide are the major moral issues of the day, but they have a murky past - as this brilliant book by Professor Wyatt shows. He explodes the popular myths behind the campaign for 'assisted dying' and proposes a better way. Every caring Christian should read this. It's a matter of life and death. This is a cracking book that lays out all the issues in the ‘assisted-suicide’ debate compassionately and with crystal clarity. It’s a road map showing the source of the euthanasia movement and the desire for control and choice that drives campaigners, and the disturbing outcomes in countries where it is already law. It warns of dangerous pressures on the elderly and disabled, and describes the ‘good death’ with palliative care.